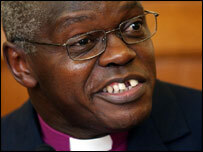 Dr John Sentamu told lay readers illiberal atheists were undermining Britain's religious heritage. He criticised government officials for sending Christmas cards marked season's greetings and Torbay council's decision to remove a cross from a crematorium. Christians should be more politically active to ensure their principles were not purged from society, he added. Dr Sentamu also criticised Birmingham council for trying to re-brand Christmas as Winterval in 1998, out of what he said was its mistaken fear of causing offence. Earlier this week Archbishop of Canterbury Rowan Williams and Catholic leader Cardinal Cormac Murphy-O'Connor launched a joint attack on what they called intolerant public atheism. In their foreword to Doing God: A Future for Faith in the Public Square, a report by new religious think tank Theos, they argued against limiting religion to the private sphere. Campaigners against religion in public life had an "intolerant faith position", they said.